Take lighting control to a whole new level with a convenient, energy-saving solution that installs in minutes. Remote controls and app-controlled wireless dimming systems are the new way to control your home lighting environment. Systems on the market today allow you to remotely control and dim fixtures, turn on and off table or floor lamps, control in-wall light switches, and even operate shades and thermostat settings. All of this can be done with just the touch of a button from anywhere in your home. Paired with smart phone apps, these systems can even be operated remotely from across town or across the country. Best of all, installation is a simple DIY job that can be done in as little as 15 minutes or less. 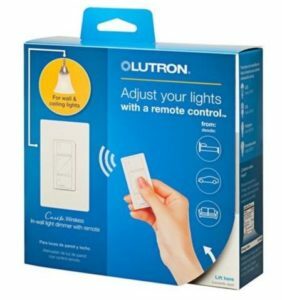 Lutron Caseta wireless remote controls and dimmers allow you to control lights and more from anywhere in your home. 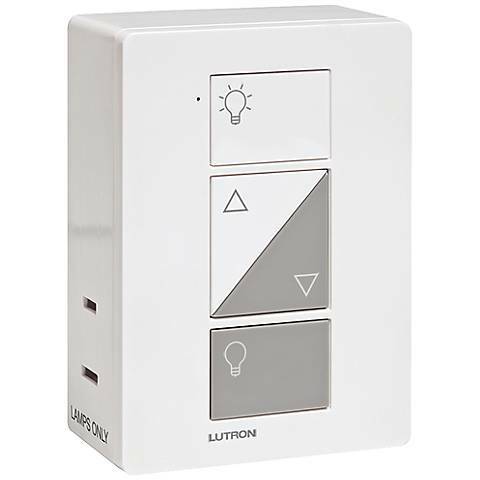 From Lutron, the Caseta system allows you to turn lights off from your bedside, turn lights on as you arrive home from work at night, or dim lights in a home theater room for movie watching. The Caseta system is built around a family of wall dimmers, switches, plug-in dimmers for table or floor lamps, a remote control, and accessories. There are starter kits available that come with everything you need, or you can buy individual components to fit your unique needs. One popular use is to connect a Caseta plug-in dimmer with a table lamp positioned in a front window. Consumers can then use the Caseta remote control to turn on the light when they arrive home at night. Another popular use is to pair a dining room chandelier with a Caseta wireless wall dimmer to control lighting for dinner parties. The Caseta system is easy to install, and the remotes work remarkable well in any home. But Lutron has taken the wireless dimmer concept a step further with the Lutron Smart Bridge router. You simply connect the Smart Bridge to your home internet wireless router, then download the Lutron app to your Apple or Android smart phone. Via the Smart Bridge router, the app allows you to control your home control lighting from anywhere in the world, at any time of day. It can even be used to control Lutron wireless shades and third-party devices like thermostats. Caseta wireless dimmers all work with dimmable LED light bulbs and dimmable compact fluorescent (CFL) light bulbs, as well as regular incandescent and halogen bulbs, giving you wide flexibility when it comes to bulb choice. Finally, it’s worth noting that the Caseta system uses Lutron’s patented Clear Connect wireless technology. This wireless system works around room corners and through home walls, and is essentially free of interference from other wireless devices or products you may have in your home. This makes the system extremely reliable and worry-free. Once you have the Caseta system installed you’ll wonder how you got along all these years without it! To learn more about the Caseta system, call us at at 1-800-782-1967 with any questions you might have or visit one of our lighting stores today.